This is the twenty-seventh Annual Report under the arrangements approved by the College in 1981.
Notable accessions this year include a large deposit of Pathfinder travel scheme papers by Mrs Lastavica. This consists of a long run of Pathfinder journals as well as administrative records, and vastly improves the College’s holdings about the history of and past participants in the scheme. There have been numerous small acquisitions of especially photographs and postcards. Details of all accessions are available in the Accession Register. Balliol’s membership of the Oxford Conservation Consortium began in October 2006. The Consortium conservators have also been advising on environmental monitoring procedures, which will be spread to Library MS collections this year. During January – May 2008 there have been 172 enquiries to the archives, (cf 207 for the same period in 2007). The total for 2007 was 529 enquiries (cf. 510 for 2006), with 297 new enquirers. The mix of enquirers is similar to previous years: requests for historic administrative documents from within the college, a wide range of enquiries from academics in Oxford and other universities in the UK and abroad, and a solid base (about half of all enquiries) of amateur family, local and military historians from around the world enquiring about individual past members and Balliol properties. In addition to the continuing project of creating detailed lists of the ca. 800 unsorted collections in the Miscellaneous Bursary Papers, Miscellaneous College Office Papers and General Miscellany classes, the Balliol Concert programmes have been indexed (about 70% finished at time of reporting) and the Coolidge Pathfinder Programme papers sent by Mrs Lastavica last summer are being listed preparatory to cataloguing (listing is nearly finished). During the Easter Vac 08, several students helped to move the Formal Archives, MBP, MCOP, MISC and Sports & Clubs classes into XXII.1&2 (and back), and to undertake a thorough inventory of the archives. This was last done in 2003, resulting in the current Archive List, compiled by John Jones, running to 242 pages in small print. We found and corrected some inconsistencies in the List, and added clarifying details, but were pleased to find no major discrepancies, and in particular nothing missing. The Statutes Exhibition was advertised throughout the university and was open Mon-Fri 12-3, Sat 12-6 and Sun 8.15-10.15. In an total of 23 hours opening, 105 people signed the visitors’ book. About 1/3 of these were Balliol Fellows and staff. A good handful of Balliol graduates and undergraduates also visited. About 20 were graduates of Chicago University who were attending a Continuing Education course in Oxford and happened to have booked a college tour during Exhibition opening hours. We can assume that a few visitors did not sign the book. Contrary to expectations, very few Old Members arrived in Balliol much before dinner and only two visited the exhibition on Saturday afternoon, hence the Sunday opening hours, which drew 9 more. Visitors generally examined everything in detail, asked questions and were much higher quality than quantity. 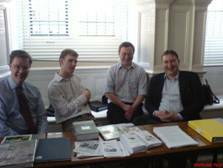 ◄ I was one of the college archivists staffing the usual table at the fourth annual History Thesis Fair, held in May in the Exam Schools, and at the new Graduate Thesis Fair in October 07. John Jones and I have been asked by the organisers, via the Conference Manager, to participate in a Conference about Adam Smith, to be held at Balliol in January 2009. We have planned an Exhibition, for which the catalogue is nearly complete. The Exhibition, which will be staged in the Chapel by kind permission of the Chaplain, will be kept open after the Conference for members of the College Monday – Wednesday 0 th week HT 2009. I have again been fortunate to work with several excellent current undergraduate assistants this year: Katherine Cross and Claire Delahunty at the end of TT07, Larry Smith in July 07, Yasmin Lynn and Christina Schoenbach in September 07 and Larry Smith again and Jo Williamson during the Easter Vac 08. I have already had requests from several students to work during the Summer Vac. Work placement efforts this year have been concentrated on basic preservation and numbering (i.e. tidying up) of the Balogh Papers for the Library. Despite a surprise find of a few more boxes near the end, we have finished stage 1 of the project: all the Balogh Papers have been brushed off, tidied up, numbered and packaged. They are free of fossilized rubber bands, rusty staples and paper clips, dead insects and the worst of the surface dirt. Corrina Connor (MPhil Mus, St Hilda’s) has been working on the Concert Programmes database on Tuesday mornings during most of the 2007-8 academic year, and made major revisions to the Bursary Books section of the Archive List during the Easter Vac inventory check. I attended the annual AMARC meeting and conference at the British Library in July 07 and the Parker Library Symposium at Corpus Christi College, Cambridge, in September 07. I continue to sit on the Computing and Portraits Committees. My initial contract with Balliol was for four years, from October 2004, and it has now been confirmed that I will be on a permanent contract from October 2008. I am delighted to be able to look forward to a future at Balliol. Enquiries about the archives can be directed to Anna by post or by email at archivist@balliol.ox.ac.uk. Enquiries about living old members should be directed to the Development Office.